Introducing the one and only, the magnificent.....sometimes I feel like Paul Bettany's character in A Knight's Tale when he introduces William Thatcher (Heath Ledger) before his jousting tournament. Makes my job interesting! When I choose an artist to join Bellissima Art Escapes, it is because I find that artist's work intriguing, inspiring and someone I would like to learn from. Leighanna Light is one of these artists. I have followed her postings of her work over the past few years and when she contacted me about working together (thank you, Katie Kendrick), it didn't take more than a second to type yes. 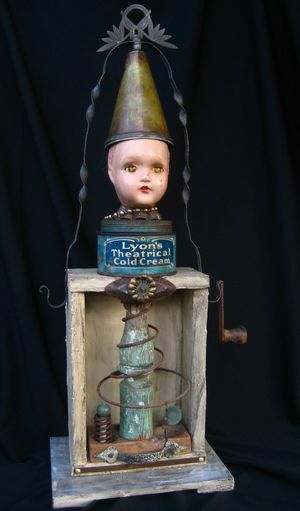 She calls herself a thingmaker but others would call her an assemblage artist. Like me, she is attracted to shiny or rusty bits and pieces. It is very addicting to collect these objects and I have the boxes and shelves to prove it. You just never know what you may need. Although the project pictured right is not an example of what you will make in one of her classes, what skills you do learn about composition, cold connections, using found objects, will allow you to stretch your imagination to create fantastical creations. Plus, if you have a spare torso lying around, you might want to attempt something like this. I have a few heads and hands, but not a torso. Always on the lookout for one of those. What's fun about Leighanna's projects are that they are not overly complicated and most people have collected items that you can incorporate into her projects. Who doesn't have a stash of metal canisters lying around for a special project? I have a whole box of them. Or rusty bits and pieces? I have even more boxes of those. Builder Bob had to build a small attachment to the garage so that I could move the gardening tools outside to leave room for more "stuff." She makes dolls, books, birds, all quirky and fun. In the three projects we have chosen you don't have to have a lot of assemblage experience, in fact, just a sense of humor and willingness to play. Here are some examples of what you will make. Time to use some of that "stuff" you have been collecting. I know I am looking forward to using some of mine. Go here to register. Come play with us! How do you like the new look of the blog? Leave a comment and let me know what you think.